Closing out Men's Fashion Week in Milan was Vivienne Westwood, who put forth a lively selection for the guys next spring. The show wasn't without its usual quirkiness and we know Dame V. loves a tall topper–but we think this piece she dreamed up for Fall 2015 might be particularly appealing to a certain Mr. Pharrell Williams, who will not rest until he wears every version of her now-iconic mountain hat. Skateboard P. can't be expected to roll around all summer wearing that heavy felt fabric. And as a man with pretty badass style, he's certain to want to switch up his swag every once in a while. 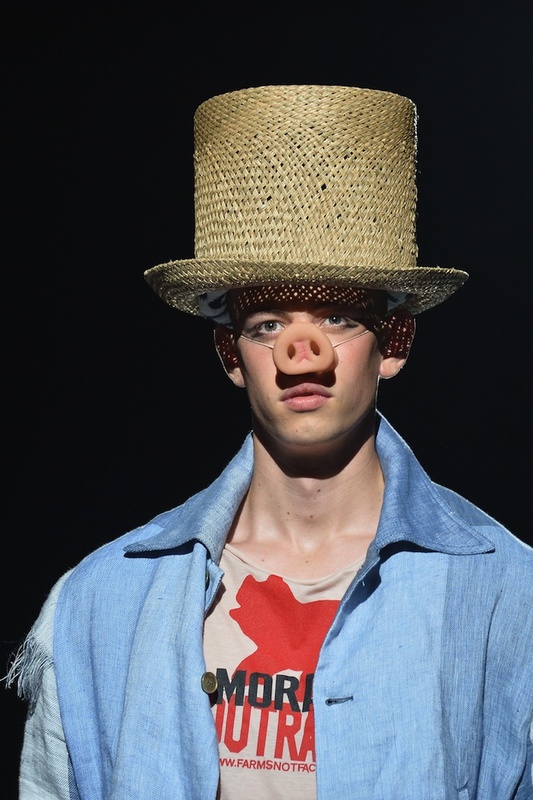 This straw top hat from Westwood's Spring 2015 collection is pretty much calling his name. "Pharrell, baby when we hitting the BET Awards?" It's the perfect accessory for one of those short suits he's so crazy about.